The Striper fishing is excellent right now. 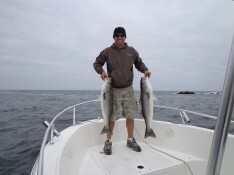 We are catching good numbers of fish every day, from slot limit size to up to fish well over 40 inches. Mackerel, pollock and herring are plentiful and fairly easy to catch right now. We saw our first blue shark of the year a few days ago, and the Tuna have been showing up here and there. No consistent bite yet from the Tuna, but they are available. Water temps have been between 56-62 depending on the wind direction, and the water is starting to clear back up from all that rain we had last week. Looking forward to fishing the heat wave this week.